Note: Due to the popularity of Part I (posted on 4/19/12), both Parts I and II (steps 8 – 12) are included here. Most poker players in Las Vegas rely on a combination of experience and luck to win their hands. But poker professionals know that Mojo is key…. 3) Ritually Array Your Chips. The magnetic force of chip structure should never be underestimated. 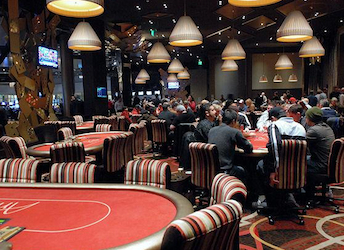 Some players mimic the chip tray, and stack 20 high to ensure an easy count and transfer. Other players opt for a stack height even with the table rim to increase unity with the pot through complex geomantic forces. Men sometimes build a single, phallic stack that, because of the lucky shirt and/or magic chair, may reach incredible proportions, risking an awkward tumble—consult astrological forecasts before attempting. Players who painstakingly align the alternating colors on the edges of their chips, creating neatly striped stacks, are OCD or owe their allegiance to an exacting god of doubtful power. Frank Gehry or Frank Lloyd Wright structures, while entertaining, repel additions. Choose a fluid structure that admits, even encourages, enlargement. A heap of unstacked chips is considered sloppy. Mojo is never sloppy. 4) Bring Your Amulet. In keeping with the like-attracts-like principle, coin amulets increase money because they are money (international currencies are preferred). Flat pebbles and medallions, placed on top of a chip stack, add luck and decorative flair. Small leprechauns, elephants, car and airplane models are usually positioned in front of the chip stacks to ward off depletion. Although current trends favor tiny Buddhas, it’s best to avoid religious amulets, which introduce potential conflict between doctrine and sin. Rabbit’s feet and other politically incorrect amulets may also attract negative energy and should be avoided. Shrine building is not allowed—large amulets are discouraged, as are multiple amulets (dealers may request that you remove it/them from the table). Since players monitor each other’s Mojo, be prepared to discuss the origin, meaning and intent of your amulet. Never tell its secret. 5) Correctly Touch the Cards. After the deal, lift the edge of the card from the poker table—just high enough to see the number—while maintaining maximum contact between the card and table felt. Cupping the cards with one hand while lifting the edge with the other concentrates power. Timing is critical and varies according to mastery and style. Some players look at each card as it is dealt (see “Summoning,” below), others wait for both cards, and still others, in the throes of clairvoyance, bet pre-flop without looking at the cards. Playing the hand to its conclusion without consulting your cards is reserved for those with advanced divinatory skill. Unless you are in the magic chair, lifting the cards off the table prior to showdown severs auspicious connections and usually results in defeat. For this reason, many players hold the image of the cards firmly in mind and refuse to touch the cards again until the hand’s conclusion. Avoid offending the Poker Gods by throwing in a losing hand with disdain. Lightly toss your cards toward the dealer. If you do it properly, the cards will arc to the level of the dealer’s heart chakra, strengthening bonds, and land just in front of his/her chip tray. 7) Understand the Importance of Libations. The color of the drink is very important. Select a drink that matches, or complements, your lucky shirt. Place it in the cup holder directly between your heart chakra and the solar plexus—the rate at which the ice melts indicates whether your play is “hot” or “cold.” Advanced players may be able to augur the future of a hand by carefully interpreting the bubbles and/or swirls visible in the liquid. Tea and coffee lend themselves to fortune telling, particularly the Starbucks brand, with its implied celestial currency (star + bucks). Consumption of alcohol usually depletes a player’s Mojo unless the player is seated in the magic chair. For this reason, advanced poker players are usually ascetics. You can tell them by their white cotton garments and their tendency to sip water at specific intervals calculated according to the lunar clock. Never, ever allow your libation to drip or spill on the table, cards or chips, lest you arouse the anger of the other players, dealer, and/or floor manager. Cocktail waitresses may come to your aid in this unfortunate situation—if they do so, tip them generously to regain your lost or “spilled” power while uttering an incantation of apology. The magic circle of the poker table should always be kept dry and clean. 9) Command the Players. While traditional spells can be prepared in advance, obtaining body samples from your opponents can be a challenge—try charming the cocktail waitress for a used glass with saliva on the rim. The at-table masseuse may also be able to procure hair samples. Hypnosis is a more practical way to control other players, particularly if you’ve spent time in a monastery or prison. (Remove sunglasses before attempting.) Look at your opponent and maintain eye contact while mentally sending him or her a firm command to “call,” “fold,” or “raise.” Make sure your pentagram tattoo is visible. Bathing in a mixture of goat milk and fresh sage prior to gaming can also strengthen secret authority over others. Grand Masters, however, control all the energy at the table by aura alone. You can easily identify them by the way their stake doubles or triples after a few short rounds of play, or by the forked line in the palm between thumb and forefinger. To monitor a player’s aura, stare at the ceiling lights of the casino for 90 seconds then squint your eyes in the direction of opponent. Predominately green auras are invincible. When the colors shift toward the red and/or lose their vibrancy, make your move. 10) Be Alert to Omens and Prophecies. Begin by distinguishing good omens from bad omens. A choice parking place at the casino, a stray chip under your chair, and chips that are warm to the touch are examples of good signs. Bad omens include: a player holding your amulet on the pretext of admiring it; cards that refuse to land in front of you on the deal; toppled chip stacks; spilled libations; fire alarms. Prophecies are similar to omens but are verbal. When a dealer shouts to the floor manager: “I have two seats on table seven,” and you are simultaneously dealt a two and a seven, this is a prophecy that your cards, although often considered the worst in the deck, are destined to earn a sizable pot. Old rock and pop songs, piped through the casino, are also useful in this regard. The Beatles’ “Eight Days A Week,” for example, prophesizes success for eight-seven connectors, regardless of suit. Prophecies may also occur in the form of overheard speech, such as a player telling a spouse, “I’ll meet you in ten minutes at nine o’clock.” See numerology, below. 11) Never Underestimate the Power of Numerology. Recognizing winning patterns in the cards during a poker game requires both intuition and analytical skill. Pay attention to cards that are repeatedly dealt to you or which are often flopped during a game. For example, a recurring nine-two unsuited may be an indication that another player at the table has put a hex on you. Raise and/or re-raise when you get your lucky numbers or favorite hands, but don’t play your X’s birthday unless you’re free of regret. Advanced players employ the Kabbalah to convert numbers into letters and augur the winner of elections and/or sporting events while waiting out a hand. Other players use the cards to receive messages from aliens via coordinates at Area 51. Note: Although playing cards were originally soothsaying instruments and have been used to successfully predict the future for centuries, in Vegas personalized forecasting is discouraged. Due to unusual magnetic energies in the valley floor, Vegas Mojo should be used to make, rather than tell, a fortune. 12) Lift Your Chalice and Summon. The ability to summon cards into your hand or onto the board is at the heart of Poker Mojo. Breathe deeply, clear your mind, focus on the cards you want, and wait patiently. It’s that simple. This entry was posted in Gambling and tagged amulet, ascetics, aura, blinds, call, cards, casino, chakra, chips, cocktails, culture, dealers, desert, dress, drinks, fashion, flop, fold, Frank Gehry, Frank Lloyd Wright, gambling, Kabbalah, libations, luck, lucky, Mojo, omen, poker, raise, seat, suited, sunglasses, tables, Texas Hold 'em, unsuited, Vegas. Bookmark the permalink. The upside of these observations is that they are all true, and will reward you if you follow them. The downside is that they cause one (me) to want badly to play, which is a junkie’s nightmare when you’re in rehab. I didn’t even think about my outer space time-without-time at the casino, until M. shot me into dream space here, and I had a sudden urge for cleavage, whiskey, monkeys (blackjack), and a three-stack tower of black chips. Alas. An old poker player in Vegas told me, “I can lose a million in one night, but I always keep $20 in my sock for the cab home.” That’s more like it, Miss Syrene. After I wrote this piece, the Poker Gods punished me for several weeks! Thanks for the comment! Thanks for this comment, Julia! You’re not far from Monte Carlo….